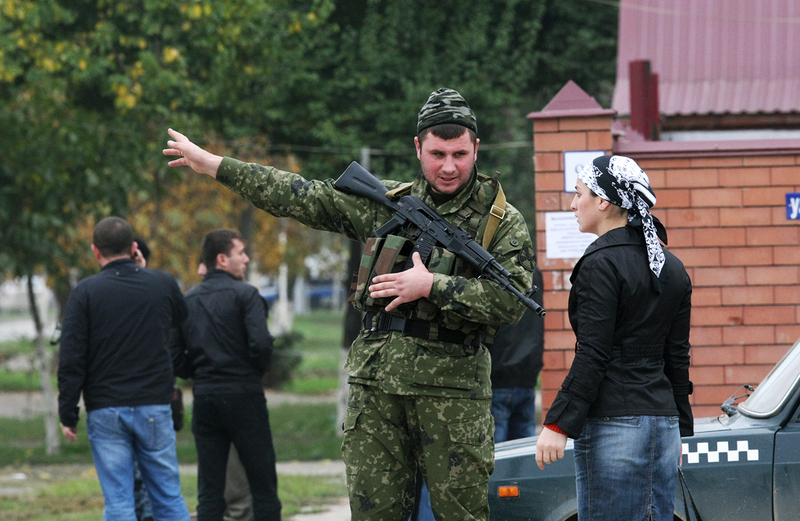 Why are Chechen villages evicting families of suspected terrorists? A special security unit officer talks to a woman in Grozny. The security threat remains high in many parts of Chechnya. Since the beginning of 2017 many Chechen villages have witnessed gatherings where locals, in the presence of government representatives, have evicted families of suspected militants and terrorists. Experts believe that the evictions are unlikely to be an effective method, as religiously motivated terrorists now tend to sever familial ties before embarking on jihad. Since the beginning of the year, a significant number of Chechen villages (the exact figure is unknown, but exceeds 10) have held gatherings where villagers evict the families and relatives of suspected militants and terrorists. According to the Kavkazki Uzel (Caucasian Knot), a Russian website specializing in the coverage of events in the Caucasus, the gatherings were also attended by government officials, law enforcement authorities and the Muslim clergy. The practice of putting this kind of pressure on the families of rebels is not new in Chechnya, experts told RBTH. Such methods were employed during the first and second Chechen wars to entice militants to shun separatism and return to the mainstream. The practice continued even after 2014, when Vladimir Putin banned Chechen President Ramzan Kadyrov from exercising this kind of “pre-trial punishment.” Kadyrov had then written this message in his Instagram blog: "The times, when parents are not responsible for the actions of their sons or daughters have come to an end. In Chechnya they will be responsible!" Experts interviewed by RBTH believe that these kinds of mass gatherings reflect the desire of the Chechen authorities to systematize the practice of eviction. The experts caution that such methods are unlikely to work against militants, because the current situation drastically differs from that of the 1990s and early 2000s. Caucasian Knot’s Editor-in-Chief Grigory Shvedov believes that the pressure on the relatives of militants is unlikely to be an effective tool in the fight against terrorism, because the main terrorist threat in Chechnya now comes from recruiters and militants of the Islamic State (ISIS). “People who have a relationship with ISIS, are tearing bonds with relatives, and in most cases have no illusions about support from their families,” Shvedov told RBTH. Although the measure contradicts Russian Federal law, it could work in Chechnya, Alexei Malashenko, Chief Researcher at the Institute of Dialogue of Civilizations, told RBTH. Alexander Iskandaryan says that the Israeli Army burns down homes of suspected terrorists to evict their families and relatives. He adds that such an approach cannot help completely destroy terrorism. ISIS recaptures Palmyra: Strategic defeat or miscalculation by Russia? Grigory Shvedov told RBTH that one needed to see the difference between religion-motivated terrorism of the ISIS type and Chechen separatism of 1990s. Shvedov said Russia should not indulge in counter propaganda with the Islamic State in the North Caucasus. ISIS would welcome counter propaganda as it can be used to their advantage. Moscow should begin to talk about “what is really happening within ISIS on the basis of documented information,” he added. The experts believe that young men in Chechnya should be made to understand the true face of ISIS. He thinks, the best solution is to give young men from the North Caucasus more opportunities for self-development.